For the past six years the UK's Herb Andrews has journeyed to the USA to crew on Ralph Hope's altered which runs in NHRA's Competition Eliminator category. In that time Herb has regularly visited Gainesville and Englishtown and last year the Holy Grail, Indy. 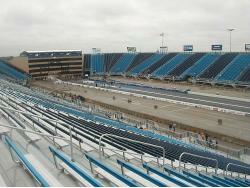 This article is Herb's account of running at back to back national events at Route 66 Raceway, Chicago and the Supernationals in Englishtown, New Jersey in June 2006. 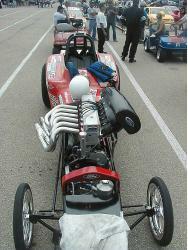 Ralph has always raced with Ford inline six-cylinder power. Prior to this trip he had run a best of 8.02/163 at Indy earlier in the year and was looking for his first seven on this trip that Herb describes as a 'Hope Adventure Tour'. Wednesday 7th June The eight-hour direct flight to Chicago was pretty uneventful. As it was completely full there was not much room to move about. Ralph was waiting for me at O'Hare Airport. He arrived the previous day, from his home in London Ontario, Canada, going directly to the track to get the car through tech inspection. We headed to the motel which was half an hour from the track, had dinner and then an early night as it normally takes me a while to get over the time difference and we had two qualifying sessions the next day. Thursday 8th June Ralph has been racing for over forty years and for most of that time, unlike most of the racers who have exotic trailers and motor homes, he has transported his race car in some form of truck, his latest is a GMC one-ton 'cube' truck, powered by a 6.5 litre turbo diesel. With the turtle deck, wheelie bar and parachute removed it goes in, just. There's very little spare room, but he's organised the available space so there's a place for everything and everything has a place. 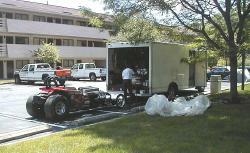 For Chicago we used the truck as transport to and from the motel, this means packing the race car away securely, which can be a slight pain, at the end of a hot and busy day but we are used to it. After unloading, we took the tech inspection card down to credentials, so we could sign on and get our event tickets. Once the car was race ready Ralph towed me round to the scales, to check we are above the minimum weight of 1600 lbs, including driver, for his class, J/A. It weighed 1615 lbs and we decided to leave it alone for the first qualifier, at 1.30 pm, where we ran 8.035/163, which was pretty stout considering it was the first run on the new 294 ci short stroke engine combination, which utilizes straight C25 petrol through Kinsler fuel injection into a Alan Johnson billet head to produce 600 horse power. 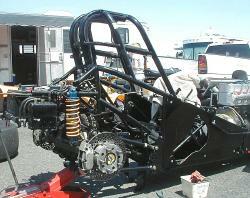 Transmission is a five-speed Liberty gearbox, normally seen in a Pro Stock. After each run we have to go through fuel check followed by the scales. Back in the pits, unless there has been a problem on the run, we check the plugs and valve clearance and decide on changes to the fuel injection and clutch for the next run. The air was worse for the second run, where it again ran an 8.03/163. Afterwards we loaded up and headed for the motel, catching dinner on the way. Friday 9th June The TV weather station was spot on when they predicted the colder weather we woke to; at best it was going to be seventy degrees, what a change from the previous day, which had been in the high eighties. The day was pretty slow because our third and final qualifying slot was at 1 pm. The car left good, ran 1.13 sixty foot time and an 8.02, however when I got to the top end to collect Ralph he was concerned as he had felt the car vibrate after 1000 feet, possibly it had got on the MSD high rpm setting of 9000. We ended up qualified twenty seventh out of the forty nine racers trying to qualify for the thirty two positions available. 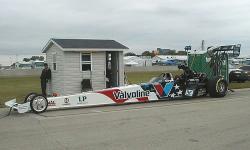 The first round of eliminations was against number eleven qualifier, former two-time NHRA World Champion Dean Carter. It was scheduled for 4 pm but oil downs and a two-car accident in Super Gas pushed it back to after the professional session at 7 pm. It was so cold, we warmed the motor for a long time in the pits and kept a blanket over the engine whilst towing to and in the staging lanes. The organisation is very slick at any NHRA event, as two race cars clear the finish line the next two have completed their burnouts and prepare to stage. As soon as those two cars leave the line the next two are given the signal to fire up. A well-choreographed show. As Ralph started to stage the visor on his new helmet started to mist up, due to the cold conditions. This partially distracted him and he red lit. Normally he would have driven it through but the clutch slipped at the 1-2 shift so he shut it off. Ralph's red light was a lucky break for Dean, who pedalled it after it shook and then shut off from his qualifying ET of 6.95 to a 9.18. Later we found out he had damaged a half shaft, so he could not answer the second round call for his next opponent, Tony Stephenson, who went on to win the event. Saturday 10th-Sunday 11th June I pulled the motel curtains back to a very cold, wet and windy day. A good part of the day was just waiting for the rain to stop so the track dryers could take effect, they were on the track from 8:00 when we arrived and seemingly on and off all day. I went down to see the first round of Barry Grants' King Demon Crown Pro Stock race within a race. The facilities are excellent, with the forty-row horseshoe-shaped grandstand seating providing great viewing, its well worth climbing to the top, if only for taking pictures. The track is very smooth, flat and very fast. Highlights from Chicago include Doug Kalitta running 280 mph, in the eighth! And Greg Anderson's 6.62/208 quickest run ever, whilst winning the King Demon Crown, and $50,000, in the dark. Its over nine hundred miles from Chicago to Englishtown and we travel through six states - Illinois, Indiana, Ohio, West Virginia, Pennsylvania and New Jersey - to get there. So on Sunday we watched eliminations until the semi finals then left the Chicago area, driving until 11 am we covered just under four hundred miles and stayed at a Motel 6 near Columbus. Monday 12th June The plan was to get up early and keep on driving until we got to Philadelphia. En route Ralph had arranged to drop off some ignition parts but finding the place, in the back of beyond, took up more time that we had planned. We arrived at a place called the King of Prussia after doing nearly 500 miles, staying at a Motel 6 with a reasonable restaurant nearby, after which it was an early night. Tuesday 13th June We arrived at Red Roofs motel at Monmouth Junction about lunchtime. There are not that many motels along US Highway 1 and it's a good forty five minutes to the track, but there's a reasonable selection of restaurants close by and as Newark Airport is thirty miles away we have stayed there a number of times. The clutch slipped pretty hard on the last pass at Chicago so finding some shade, it was in the high eighties, we serviced it in the motel parking lot. We slid the motor forward and removed the seven-inch twin-plate slider clutch. The discs were slightly glazed so they were sanded and the floater plate that separates the discs had some heat marks, and was slightly warped, so it was replaced. Wednesday 14th June The route to the track at Englishtown is across country and decent restaurants are limited. Just our luck that the one we normally stop at for breakfast is closed on a Wednesday, which does not fit the image of open all hours America, so we settled for a trip to Dunkin Dounuts. At Englishtown, Old Bridge Township Raceway Park we were directed into the spectator parking where all of the Sportsman racers patiently waited whilst the Pros were pitted. With all of the large motor homes and transporters the multi car teams like Schumacher and Force now have it was three hours before our turn. 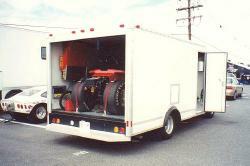 It's noticeable how many sportsman racers also now have big rigs and obviously this also adds to the wait. We met up with our friends from Florida, Bob Baumann and Gary Johnson. Bob runs a big block chevy powered Opel in Super Gas. As he was staying at the same motel, Bob offered to transport us to and from the track each day, which made things easier. Thursday 15th June Having got through tech early we removed the new Weld wheels from the front, as both had slow leaks and Ralph had the Goodyear people remove the tyres and soap them up which cured the leaks. We went through the normal routine before a run, warming the engine, charging the battery, checking valve clearance, whilst keeping an eye on the weather station etc. I also reset the MSD high RPM limiter to 9400. There was only one qualifier scheduled today and the car rolled the lights, this kills the ET, which was a disappointing 8.24. The problem with a National event is once you get behind, it can be sometimes impossible to catch up, as if there is too much downtime NHRA have to reschedule, which can mean the Sportsman racers get their runs rearranged or cancelled, at short notice. Friday 16th June The shorter stoke motor Ralph was running is a new combination for these races and it produces more torque. Checking our data from Chicago we knew we were close on the clutch settings after it ran the 1.13 sixty foot and 8.02 there. So for the second qualifier we added 2.6 grams counterweight to each of the three clutch fingers and one flat of static. 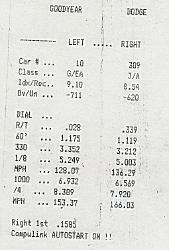 Running against Frankie Aragona, the car left nicely, although not on the wheelie bar, and ran well through the gears, and straight, so I was not really surprised to see 7.92/166 on the scoreboards, with a 1.11 sixty foot. What is amazing about the run is given the close confines of the cockpit Ralph manually shifts the five-speed Liberty gearbox. What a ride! I flashed the truck lights as we got close to Ralph at the top end and as we walked towards him I held up seven fingers. Ralph was pushing the race car towards us and smiling, as it felt a good run. I assumed he was aware of the time it had run. He was not however, as there are no speakers at the far end, so for a moment he was taken back when I told him what it had ran, then we shook hands and took in the moment, as for Ralph it had been a long time coming. We then towed to the fuel check followed by the scales. Back in the pits we discussed the run, along with Bob and Gary then started to get ready for the third and final qualifier scheduled at 4 pm, however due to oil downs, which although NHRA dealt with very efficiently, it was rescheduled to 8.30 pm. In the staging lanes we went through the normal procedure of fitting the nose cone over the fuel cell and strapping Ralph into the car. I had checked one of the tyres for correct pressure of five pounds, and was going to the other wheel when I noticed the parachute drogue chute laying on the wheelie bar, at this point we were about four cars away from being pulled up to run. Shouting to Ralph that the chute had come out I got the long shoe lace we use to pull the bag together from the truck and at the same time Ralph got himself out of the car, we quickly repacked the chute, Ralph getting back into the car as the marshal called us forward. Pulling the race car out on to the floodlit track was amazing, the brightness of the lights giving it an eerie feeling to the place. I was anticipating 7.8s after the run earlier in the day. However, whilst the car left pretty well, with a 1.13 sixty foot, Ralph felt a heavy vibration in high gear, immediately shutting it off to an 8.58. By the time we got back to the pits it was 9.30 so we pulled the rocker box but could find no problem so we decided to pack up and check it out in the morning. It was too late to find a restaurant on the way back to the motel so we stopped at 'Wa Wa', a local 'convenience store' and picked up a few snacks, we got back to the motel about eleven, had a few beers and headed for bed. Saturday 17th June Getting to the track early we did a compression check, checked for broken valve springs, drained the transmission and rear axle oils, looking for debris, and also checked the ignition but found no problems. Our best theory was the MSD two-step had been activated down track; it's used for the launch and is set to 7500, which would explain the vibration. As insurance we changed the microswitch located on the clutch pedal. We also increased the launch RPM to 7700, changed the counterweight back to five grams and added another flat to the clutch static. Due to local bye laws engines cannot be started before 10 am and as we were scheduled to run at 10.30 this gave little time to warm the engine, change plugs, charge the battery and top up the fuel tank. The NHRA official called us at 10.15 and we rolled shortly afterwards, pulling into the staging lanes the officials there pointing to the allocated lane. Ralph was the quicker qualifier, so he told his opponent, Jonathan Aloisio, that he would run in the right lane. We were tight on time so Bob helped buckle Ralph in whilst I slowly towed to the head of the staging lanes. In the race, the car pulled through the light, as we had seen the previous day and we got a red light. It's a strange feeling to see the lights coming down and the car starting to roll forward, knowing that's its going to red light, you all most want to be able to get hold of the car and pull it back! All that effort to get to this point and there is nothing I could do but watch. Ralph drove it through to an 8.02/164, which was a bonus. We spent the rest of the day packing the car away into the truck and watching some racing. It may sound strange but in the past I have been to National events where we have been working on the car and missed most of the Pros run, only finding out how well they ran when I got back to the UK. Sunday 18th June There was no desperate rush to get to the track so we had a lay in and then breakfast en route. Ralph's friend, Allayn Armstrong, who qualified number one with an 8.81 which was .821 under the 9.64 index, was pitted next to us. Unfortunately he lost in the semi finals but what is amazing is that Allayn's car is powered by a 160 ci four-cylinder Pontiac, fitted with a small block Chevy cylinder head and Kinsler electronic fuel injection. A genuine rocket ship screamer, the high RPM burnout and launch has to be heard to be believed. Other highlights from Englishtown include the quickest Pro Stock field in NHRA history and Hot Rod Fuller winning Top Fuel over Larry Dixon. Monday 19th June After the past two weeks, today was an anti climax, as I was going home. Ralph dropped me at Newark Airport at 7 am, as he wanted to travel most of the way in the daylight. My flight was not until 9 pm, so I had a lot of time on my hands. I roughed out this article, also met some friends of Nobby Hills', it's amazing who you bump into at an airport, and had a few beers. On most return trips I have come home with race parts, recent luggage included a five-speed Liberty air-shifted gearbox (now fitted to Paranoia), twin plate slider clutch, an 83/4 rear end and MSD ignition parts. Understandably security has been stepped up after 9/11 so usually after the light above the X-Ray starts flashing I get to explain "What's in the bags". This time it was only some more MSD parts so security had no problem with that. To summarise, I found putting my thoughts down on paper took a long time, was very frustrating and hard to do, so fair play to anybody who does it for a living. However one of the reasons behind doing it, is over the years I've been very lucky to attend in excess of fifty NHRA national events, and whilst initially it's great to spectate, as the action just keeps coming, I would recommend to anybody to get involved by crewing for a team. It's easy to contact them with offers of help as there's various websites available, probably it will not cost you very much and you get a behind the scene insight into racing that you do not see by spectating. I would have like to have included more pictures but as generally its just Ralph and I running the car there's limited time to take them. One final thing, after over forty years of racing, Ralph has been talking for some time about retiring. Since I started this article he has made that decision so his last National event will be the Torco Fuels NHRA Nationals at Richmond Virginia this October, after which the car will be advertised on Eurodragster's Swap Meet, so he may well come over and run it in Europe.